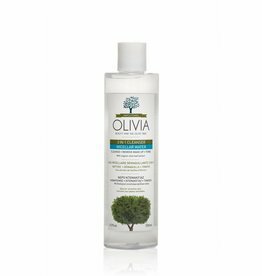 Olivia 3 in 1 Cleansing Gel’s rich foam allows you to cleanse, remove makeup and tone in one smooth motion. It gently removes everyday impurities and make up without dehydrating or irritating the skin, for a refreshed look and feel. Infused with organic olive leaf extract, rich in oleuropein, a natural antioxidant, simultaneously soothes, pampers and tones the skin without a greasy or tight feeling. The result is a fresh, shiny and smooth look.